The CSA Open Certification Framework (OCF) Working Group is an industry initiative to allow global, accredited, trusted certification of cloud providers. The CSA Open Certification Framework (OCF) Working Group is a program for flexible, incremental and multi-layered cloud provider certification according to the Cloud Security Alliance’s industry leading security guidance and control objectives. The program will integrate with popular third-party assessment and attestation statements developed within the public accounting community to avoid duplication of effort and cost. The CSA Open Certification Framework (OCF) Working Group is based upon the control objectives and continuous monitoring structure as defined within the CSA GRC (Governance, Risk and Compliance) Stack research projects. 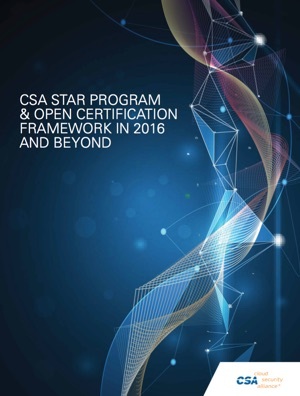 The CSA Open Certification Framework (OCF) Working Group will support several tiers, recognizing the varying assurance requirements and maturity levels of providers and consumers. These will range from the CSA Security, Trust and Assurance Registry (STAR) self-assessment to high-assurance specifications that are continuously monitored. A path for any region to address compliance concerns with trusted, global best practices. For example, we expect governments to be heavy adopters of the CSA Open Certification Framework to layer their own unique requirements on top of the GRC Stack and provide agile certification of public sector cloud usage. An explicit guidance for providers on how to use GRC Stack tools for multiple certification efforts. For example, scoping documentation will articulate the means by which a provider may follow an ISO/IEC 27001 certification path that incorporates the CSA Cloud Controls Matrix (CCM). A “recognition scheme” that would allow us to support ISO, AICPA and potentially others that incorporate CSA IP inside of their certifications/framework. CSA supports certify-once, use-often, where possible. CSA aims to harmonize and simplify provider certifications, not complicate them. Audrey leads the IT Risk / Cyber Security Services practices. She has over 25 years of public accounting experience in several industries and is a Certified Public Accountant (CPA), Certified Information Systems Auditor (CISA), and a Certified Information Technology Professional (CITP). In addition to developing internal control methodology for a national practice, Audrey has managed and led Internal Audit and IT risk assessments, enterprise-wide. These reviews have included those in support of Sarbanes Oxley, general controls reviews, pre- and post-implementation reviews (including SAP, Oracle and Peoplesoft), compliance reviews, Internal Audit Quality Assessment Reviews (QAR), IT Due Diligence and IT Strategy Advisory. On the SOC 1 and Agreed Upon Procedures attestation projects, Audrey has served as signing partner, quality review partner and peer review partner. Andreas Fuchsberger is a Standards Officer in Microsoft’s Corporate Standards Group. In this role he participates in the international standards community, predominantly attending ISO/IEC JTC 1/SC 27 (IT Security Techniques) as a UK NB delegate and ITU-T SG 17 (Security) as an ISO invited expert. Currently for SC 27 he is the convener of the Special Working Group on Traversal Items and the editor of 2 international standards on network security and security information and event management (SIEM). Previously Andreas was a full-time academic at the internationally recognized Information Security Group at Royal Holloway, University of London, where he previously lectured in the areas of network, computer and software security. He has over 20 years of experience in teaching and running training programmes in IT security architecture, design and programming. He has published articles on programming and network security, intrusion detection/prevention and vulnerability analysis. Andreas holds the joint CSA/(ISC)2 CCSP as well as CISSP, ISSAP and CSSLP credentials of (ISC)2. He is a registered Chartered Engineer (CEng) of the Engineering Council UK as well as a EUR ING of Fédération Européenne d’Associations Nationales d’Ingénieurs (FEANI). Contributions: Co-chair of the CSA’s International Standardization Council and Open Certification Working Group Leadership. Speaker at numerous events, including the 2015 U.S. Congress and the CSA APAC CISO Forum in 2013. John DiMaria is the Sr. Product Manager, System Certification for BSI Americas. He has 30 years of successful experience in Standards and management System Development, including Information Systems, ISMS, Business Continuity and Quality Assurance. John is responsible for overseeing, product roll-out, and client/sales education. He is a product spokesperson for BSI Americas regarding all standards covering Risk, Quality, Sustainability and Regulatory Compliance. John was one of the key innovators of CSA STAR Certification for cloud providers, a contributing author of the American Bar Association’s Cybersecurity Handbook, a working group member and key contributor to the NIST Cybersecurity Framework. He currently serves as the CSA OCF and CTP working group Co-Chair and is a member of the SME and CSA Financial Services Stakeholder Platform (FSSP) Working Groups. John has been a keynote speaker internationally, and featured in many publications concerning various topics regarding security, quality and business continuity. He has served on committees that influence legislation and drive international harmonization such as the ANAB PS-Prep (Title IX) committee of experts, Shared Assessment Program, and the Cloud Security Alliance (CSA) Controls Matrix Development Committee. He currently serves on the ANSI Energy Efficiency Standardization Coordination Collaborative (EESCC). He is a BCI award winner, and BSI Innovation award winner. Contributions: Co-chair of the Open Certification Framework (OCF) and Cloud Trust Protocol (CTP) Working Groups; key innovator and co-author of the CSA STAR certification; designed and developed the CSA STAR webinars. Daniele Catteddu is an information security and risk management practitioner, technologies expert and privacy evangelist with over 15 of experience. He worked in several senior roles both in the private and public sector. He is member of various national and international security expert groups and committees on cyber-security and privacy, keynote speaker at several conferences and author of numerous studies and papers on risk management, cyber security and privacy. Mr Catteddu is the co-founder and executive of the CSA Open Certification Framework / STAR Program. Moreover he leads definition and implementation of the CSA research agenda in Europe and manages the relations with European public institutions and is member of the CSA International Standardization Council. He has been recently appointed as Member of the Policy and Scientific Committee of the European Privacy Association. In past he worked at CSA as Managing Director for the EMEA Region, at ENISA (European Network and Information Security Agency), as Expert in areas of Critical Information Infrastructure Protection (CIIP) and Emerging and Future Risks Management, and in particular, having a leading role in developing EU cloud security research. Before joining ENISA, Daniele worked as an Information Security consultant in the banking and financial sector. Daniele graduated from the University of Parma (Italy) in Business Administration and Economics, and he is an ISACA Certified Information Security Manager. Please contact Open Certification Framework (OCF) Working Group Leadership for more information. Want to contribute to the Open Certification Framework (OCF) Working Group? Which Open Certification Framework (OCF) Working Group initiative are you most interested in? Your request to join Open Certification Framework (OCF) has been recorded. Someone will be in touch with you soon with more instructions. There are a number of control areas on the CCM that will each be awarded a management capability score on a scale of 1-15. This 2nd version release includes alignment with the CCM v1.4 and v3.X. The following guidelines will help you to apply good practice in publicizing, communicating and promoting your certification to stakeholders, including staff, customers and business partners, and to the general public. This document outlines how to conduct a STAR certification assessments to the Cloud Controls Matrix (CCM) as part of an ISO 27001 assessment.